Your character must be at least Level 2 to start this quest. 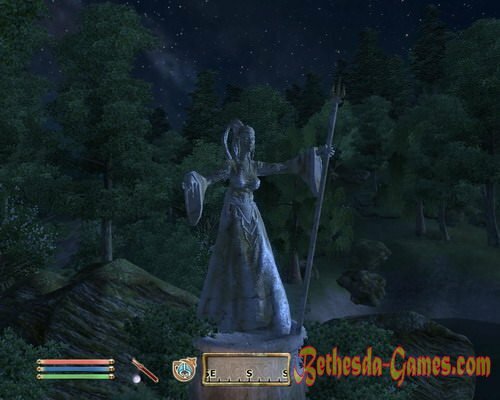 Statue of Queen of the night sky is located in the northeast of Cyrodiil, north of Lake Arrius. 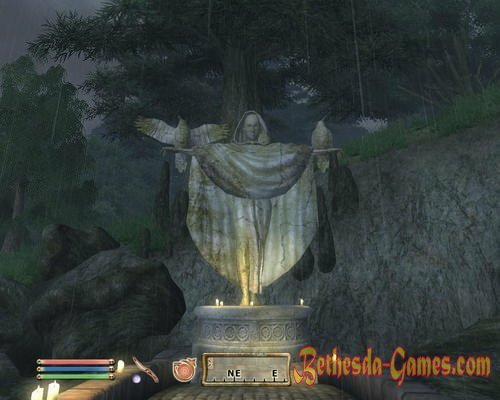 You can talk with Daedra to the following conditions: a visit must be applied at sunrise or sunset, and you must make an offering in the form of glowing dust. Azura asks us to bring calm her five followers who many years ago killed a vampire Dratika and its relatives, but had the misfortune to catch yourself. Knowing what fate awaits them cultists sealed himself in the desolate mine, located to the southwest of the sanctuary. Earlier the cave was closed and it was impossible to open the lock without a key, but now Azura opened entrance. In the cave, we are waiting for five aggressive bloodsuckers norovyaschih shake the soul from the body of any traveler sunuvshegosya in their den, but they are not yet familiar with us. Calming the top three, is located in one of the corners of the cave a rope hanging from the top, tugging at her and dive into the opened secret passage, where we continue begun. Disposing of the former admirers of Azura, return for a reward - Queen dawn and dusk we will present a reusable soul gem, Azura's Star. And above the altar Daedra will now be lit five candles in memory of the followers of Azura, clan slaughtered threatening creatures and have sacrificed their own destiny. Shegorata statue is located south of County Bravo. To find out what is required offerings to Lord of Madness, you need to talk to Ferunom Ravel. Dunmer mutters all sorts of nonsense, but in the end still says Shegoratu suitable small stone shower, head of lettuce and a bit of yarn. Strange set, do not you? That, however, is not surprising for the Lord of Madness. Shegorat, apparently bored, but because our task - to cheer His Majesty. To the south of the sanctuary is the settlement of border posts, inhabited by Khajiit. They are very superstitious and around seeing signs and omens. Daedric Prince wants us to go there and have realized one of the prophecies. Upon arrival, look for a local shaman, Ri'Bassu and talk with him about the prophecy K'Sharra. Khajiit tells the story of his ancestor, predicted that the time will come when the gods yavyat residents of villages three signs that says about the doomsday: the invasion of pests (rats, according to the Khajiit), hunger and fear. More anything efficient to get the cat will not succeed, but he advises us to stay in the tavern, the owner of which owns the most complete collection of cheese in the Empire. This information, in the light of the knowledge of the inhabitants of the town before the fear of rats, come in handy. It is necessary to visit a local restaurant. S'Tasa, owner of the tavern, praising his collection, and places special emphasis on cheese Olroy fragrance of which stands almost to the heavens. Drooling, cat observes that if she tried to do something with them to prepare the smell attracted to rats from all around. Just what we need! Collection of cheeses to the left of the output for the showcase. Oh, what only varieties is not here - here and Cheddar cheese, and Marble cheese, and Blue ... But we are interested in cheese Olroy stored for a separate showcase. Break the lock, just in case we stop up the nose and kradёm cheese. We leave the restaurant, and we place a piece of cheese in a pot standing nearby. It seems S'Tasa knowingly kept this cheese only for aesthetic pleasure - thrown into the pot, cheese began to emit a stench that in an instant settlement flooded rat! Excited Ri'Bassa, running around town and scattered handfuls of rat poison left and right, insists that this is the first sign and the beginning of the prophecy. The second digit must be a famine. Select a pinch of rat poison and go to the stables. Pour poison into the feeder and wait until the sheep will be safe to eat for. Rat poison, as can be judged from the dinner and leaning hoof animals, acts not only on rats. Here in our head will hear the voice of the Lord of Madness. Shegorat, pleased uchinёnnym disorder ordered to walk to the center of the border post and wait ... 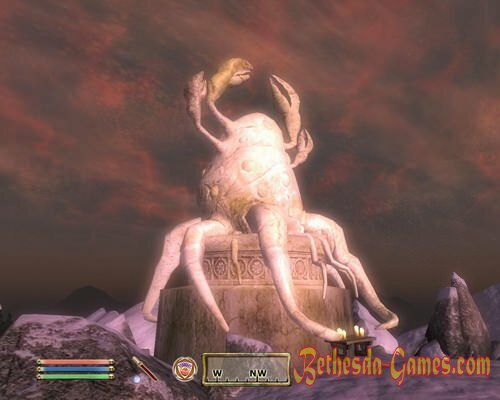 There, before our eyes, Daedra sends a burning city pack of dogs falling from the sky! Streets littered with burning corpses of dogs, the villagers panicked run through the streets, and we're pretty rubbing their hands - it's done! It's time to go for a reward. Shegorat, razveselёnny antics in the settlement of Khajiit, gives us "a nice little toy" - an artifact Wabbajack. At first glance, this thing is useless, but it can have some fun and try your luck in the battle against powerful monsters. Artifact Description: The madness and chaos represent Shegorata. Wabbajack is the embodiment of his master and all his worst qualities. As soon as you use the Wabbajack effect on any monster attacks you, he will turn into another random creature. For example, you can turn into a rat ogre and greatly facilitate their part in the battle. However gryazekrab, under the effect of enchantment, can become, for example, a troll. So think before you play with fire. Note: If you have already passed the storyline Shivering Isles, instead Shegorata you speak Haskill. For the execution of the task, however, is not affected. Your character must be at least level 5 to start the job. Statue Namir rises in the mountains east of Broome, in the territory of the county. 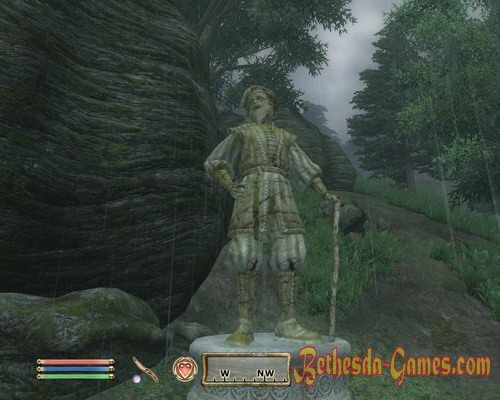 The condition for exploring the Daedra is simple: you need to have a face like unto a vagabond in the nearest garbage. Once napёmsya cheap wine or similar drink on the properties and lower the attractiveness of the mark of 20 points or less, you can safely go to Namir. Daedra concerned that ministers Arkay attempt to cover Anga, elven ruins south of the images, and save the Forgotten, fanatical Namir admirers, voluntarily suffering in the darkness of ruins. Daedra teaches us spell Cover Chubais Namir, which will have to be imposed on priests to deprive them of light - Namir fans accustomed to the dark. And after darkness envelops servants arch Forgotten cope with them without our help. We leave in ruins and looking in the dark priests, swaggering through the maze of ruins and poked into every corner of the torch. They just do not have enough holy water. Namir kastuem spell on the first victim, depriving it of light and wait on the sidelines until the crowd Forgotten peel servant of God of Life and Death. You do not have to follow the process, and immediately go in search of the next benefactor. When all the priests will be defeated, leaving fanatics with their suffering, and themselves to tread Namir. Daedra appreciates our merits - now replenished inventory Ring Namir (reflected damage over 12%; 10% reflection spells on themselves, a permanent effect). Note: if a stray swing of the blade will cause the death of one of the most neglected, the job will fail. A similar finale awaits you if you killed one of the priests - Namir fans have to do it yourself. Verminy statue is located in Nibeneyskogo pool, on the shores of Lake Poppad that the south-west of Cheydinhal. One of the admirers of the Daedra reports that conversation with Daedra lord must offer black stone shower. Vermina greets us as if only expected date. The lady says that this is it, we should be grateful for the rich dreams (nightmares for the most part), and now it's time to serve the Daedra. Magician Arkvedom was stolen Bowl Verminy subsequently dragged them out of the realm Verminy in the real world, while you sleep. Daedra, of course, wants to return to his property. Well, who will deal with you, of course, already knew. Moving to the Tower Arkveda that south of the sanctuary. Residence magician seems typical of the fort, but it soon becomes clear that the first impression is deceptive. After the first standard rooms start at Extreme events - falls to us a unique opportunity to observe the realm of nightmares Verminy in the usual Nirni: see furniture on the ceiling in one of the rooms; pass through the narrow bridge which goes way over the frightening abyss; witness the giant bedroom, furnished with a giant furniture; walk the corridors, stained with blood; open the door, behind which is not found nothing but walls and other equipment, so dear to the heart of an adventurer surrounding circumstances. All this, of course, diluted monsters that entertain us in his own way. Finally, passing the maze of dungeons, we find ourselves in pochivalne culprit parade. But everything is not the glory of God - the magician sleeps soundly in bed, determined to remain forever in the realm of Verminy, and indeed the bedroom like a little vacation spot. Next, by the way, is a note Arkveda in which he expresses his desire to remain forever in the House Verminy, citing the fact that the one who traveled the country of dreams - the greatest traveler. Also magician modestly observes that from now on he is the master of time and space, and now he has no fear. However, are we going to freak kids not to baptize, but because just come to the table in the corner of the room and pick up the ball Verminy. We reserve the magician with his fantasies and left the realm of nightmares, go to the ball to his owner. Daedra is satisfied that the ball is returned, and Arkved living out their days in a nightmare, and presents us with a staff Skull of Corruption. Enchanting imposed on a stick, you can create a double enemy, fighting on your side. Note: black soul gem that we need as an offering for Verminy can be removed from the corpses of necromancers, or make themselves at special altars. Find these altars can be in the following locations: Cave Black kink, Fort Istirus, Fort Linchal, elven ruins Vendelbek. To create a cobblestone you need to put on the altar of the great stone shower and at night when the sky will fall with light pink shade cast on the altar Conclusion (Shower Trap). Your character must be at least 8th level to start this quest. Daedric Sanctuary is located to the north-west of Skingrad. Engorm, one of the fans sanguine, explains that if we want to call it master and share with them the dances and fun Cyrodilic brandy will be suitable offering. Dancing is, of course, for an amateur, but talk to the Daedra, we will not give up. sanguine wants us to be revived one of the boring dinner parties arranged by the mistress of the castle Leyaviina. Daedric Prince teaches us spell Frozen Reality, the effect of which is superimposed on the Countess and her guests must make a feast much more interesting. But we must act discreetly, and let the party is by invitation only. We'll have to find a way to get inside yourself. Taking with him the necessary belongings, go on the road - not a short path to Leyaviina. Once reach the goal and find ourselves in the castle before the locked door to the room where the countess and her feasting friends, you will have to talk to the guard, on duty at the entrance. Talk on topics of interest to us, as well as to meet the guests, he will begin just after six o'clock in the evening. If we dressed decently enough, he took us for one of the guests, let us not talk. If that hangs on our figure is more like rags, will have to raise his attitude to his money, or eloquence. As soon as the indicator of persuasion will reach 70 points, the guard will miss us inside though entirely without clothes. It was then the fun begins. While about anything unsuspecting ladies and gentlemen talking at the table, we impose on reality Cured present. It is best to aim at the center of the table, otherwise anyone can fall under the spell. If all goes smoothly, naked guests in a panic rush across the room, calling for help in custody. Bah, we ourselves stand in the buff! Security is regarded committed an impact on us as friends Countess attack, we hasten to submit claims - as with all inventory disappeared and gold, we can only go to jail or be resisted. However, you can simply run away. Burnt by the events of last night, back to the sanguine. Merry encourages our success stick Rose sanguine calling to our aid in combat random younger Daedra. All our stuff, by the way, lie in a chest nearby. Note: if you cast a spell on the revelers, but it is not embraced all present, and guard managed to grab you and put the spell will disappear from your inventory, and the mission is over. All your things, however, will be returned. Your character must be at least level 10 to begin this quest. If you exit Leyaviina and move north along the Yellow road, you will soon find sanctuary Nocturnal. Lady of the Night has lost its eyes, two stolen Argonian of Leyaviina. Lizards think that went unnoticed, but his eyes saw them, because some of Nocturnal and confident in their own fault. We need to go to the city to find thieves and find out where they hid the eye, and then return to its rightful owner. Talk to one of the guards Leyaviina, you can find out what some Bedzin and Vibam-On boasted some gem. Last, according to the guardian of order, always engaged in some kind of scam. Find lizards can be in a hut Vibam-On the contrary homes for sale. Argonians that one that another, say that and never heard about any stolen artifacts. Well, do not want to split themselves, will act cunning. Pretend to leave the house, they themselves will hide (perfectly suitable for this entrance), and listen to what they will talk thieves. From the conversation, it follows that the Eye of Nocturnal hidden in a cave of the tidal wave. Dungeon located in the south of Cyrodiil in Topalskoy bay from the Black Forest. Back and then we go. Stepping into the darkness of the cave, carefully moving forward and straightened with trolls who settled in the dungeon. Soon, passing a few turns in the corner of the cave, under water, you find the desired object. Taking the eye and bear discovery Mistress of the Night. Nocturnal satisfied with our success. As a reward we receive eternal lock pick (it - Skeleton Key), increases skill points thieves tools as much as 40 points, and do not break after a failed attempt to break the lock. Perito Sanctuary can be found on the south-east of Cyrodiil, west of Lake Kanulus the River Silver Fish. As we approached the sanctuary, once it becomes clear that was something strange: Overseer followers do not move and seems in general unconscious. As is clear from talking to Perito, his followers uttered a spell to bring his master. This nonsense has had its consequences - is now their souls caught up in between worlds. While the body of the cultists are here, their souls wander the plan Oblivion. We are required to reunite the soul and body shell. Once thoroughly prepare for the journey to the other world, once again talk to Perito. Overseer send us a plan of Oblivion, which are captured. This plan is not very different from the others, except that it is larger in area. Be prepared to attack younger Daedra. Just need to find and "build" five souls. Make it easy, and once all souls will be found, Perito open the portal. Once inside, we again find ourselves in their world. The warden happy with the restoration of the natural order of things, and blessed us, gives a legendary shield Spell Breaker (heavy armor, spells a 30% reflection on itself, a permanent effect). Meridia Sanctuary is located west of Skingrad. As an offering to Mrs. infinite energy remains perfect her enemies undead. This can be bone meal, dead flesh or ectoplasm. Meridia is the call - she was glad to see that the battle with the undead not alien to us. The essence of the job is as follows: the lady just can not bear skeletons, zombies and the like, the fruits of labor of necromancers. Meridia is furious that they break the grave in search of material for his experiments. In the depths of the cave Shrieking just inhabit these types. To earn the appreciation lovely lady, you must destroy the necromancers and the fact that they have generated, experimenting with the bodies of the deceased. Entrance to the cave can be found to the east of Skingrad. Go down and explore the dungeon corridors. Sooner or later, we will find ourselves at an impasse, but not in a hurry to unfold - long wall blocks our path, drive off, leaving the possibility of further research. A stone barrier is found wooden door leading into the lower tunnels, which are detected and gentlemen necromancers. Prepodaёm villains and begotten of the undead lesson in one room and go to another to continue teaching. Goals we share, the funds - too, so bad uncle quickly show what's what, and in a hurry for wages. Reaching the statue again talking with Merida and accept a present - Ring of Khajiit (35% chameleon itself, increasing the speed of 10 units. Itself, a permanent effect). Sanctuary Patron persecuted and despised situated in the west of Cyrodiil, on the Gold Coast to the north of Anvil, with a slight deviation to the west. 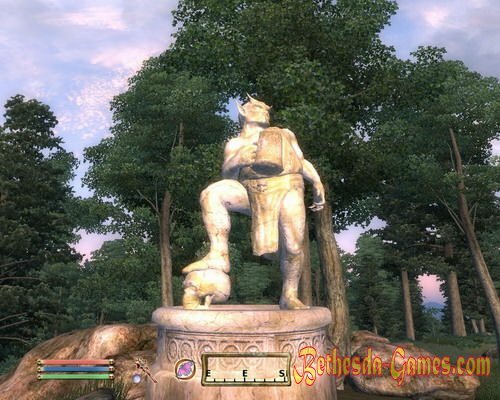 Daedra Lord can end, leaving his sculptures fat troll. Daedric Prince will be satisfied with our present and induct: Lord Drad having an estate just south-east of the sanctuary, chained ogre, pets Malacath, in chains and forced to plow it in mines. Malacath, of course, does not like his brothers smaller injected at Drada as donkeys. Our task - to find and free their prisoners. A visit to the Lord brings a bit of good - and he does not want to hear anything about the release of ogres. Drad believes that thanks to him, though they bring some benefit to the world. Well, there is no way we will act independently. After a conversation with a cute wife of the landlord, go to dull mine that just behind the wicket estate. Inside wandering guards norovyaschie stop our person and pobormotat any threat. Bypass them and make our way inside, until find caged ogres. If you bare blade guards will spot you will attack without warning. Without paying any attention to the guards (still after the liberation of thugs prouchat his jailers) break the lock and rush to the next chamber. We perform a similar operation and leave the cave - ogres perfectly cope with custody and without our help. However, if you do not want to work with a master key, it is possible to kill jailers and remove the keys from their corpses. Malacath does not hide his satisfaction - Daedra laughing, confident that now Drad will plow on ogres, and not vice versa. For the work of the Guardian of the Blood Curse gives us a gift - Hammer Volendrung (paralysis for 3 sec. When struck; exhaustion health units 5. 20 sec. When struck). Note: if the next time you also will appear to the estate of Lord Drada, you will become a witness of how a former lord and his wife work in the beds under the close supervision of its new owners - ogres. Your character must be at least level 15 to begin this quest. Statue Spinners Networks hid in the thick branches of the trees in the area of Hartland, north of the Imperial City, with a slight deviation to the east. 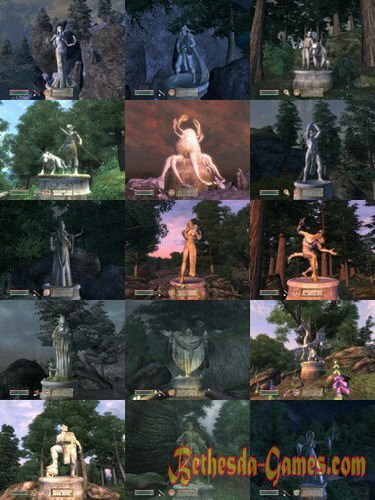 In order to get an audience with Mephala, you must keep the statues offering a flower nightshade between midnight and dawn. In the settlement way is sad live two families Nords and Dunmer. At first glance, they live in harmony, but in fact for the external well-concealed hostility. To win the favor of the Daedra, we need to kill the heads of these two families, leaving the evidence showing that the murder - the handiwork of another family. At the same time will have to use all your skills of stealth or possession spells of illusion - can not be to someone noticed us. Also rotate this thing reasonable under the cover of night, when our victims are sleeping. The village is located to the west of the sanctuary Mephala. Once in place, the residents learn about the founders of the village (which, incidentally, is not required) and go to the house of the first "client" - Dunmer Niva Dalvilu. While dark elf snuffle in his bed and does not know about the invasion of his abode, quietly sneak up on sleeping and quickly released to the spirit. Before you leave the hut, pick up from the table ceremonial dagger Dalvilu. Knife provides a great piece of evidence for the false accusation. Now came the turn of Khrol Ulfgara, to rest in his home. Kradёmsya the attic and quietly kill Nordling. On the body of the murdered reserve staschenny of head of the family home Dalvilu dagger and head for the exit. On the way down the stairs to the attic, we catch lying on the table ring Ulfgar family, which subsequently will be on the body Niva Dalvilu. It's time to add fuel to the fire - go to the tavern and tell Innkeeper (or any other waking villager) about the recent events. Girl grabs his gun and jumps into the street, led by the blind thirst for revenge. But outside is already in full swing feud - the clash of two families appeared inevitable in the light of what happened. Well, our employer just what is necessary - admired for a brawl, we go way back for a reward. Spinner Networks glad we sown discord. The award is for his trouble - Ebon Blade (silence for 10 sec. When struck; absorption health 8 units. Impact). Your character must be at least level 17 to begin this quest. Girtsina sanctuary located just south of the Imperial City. 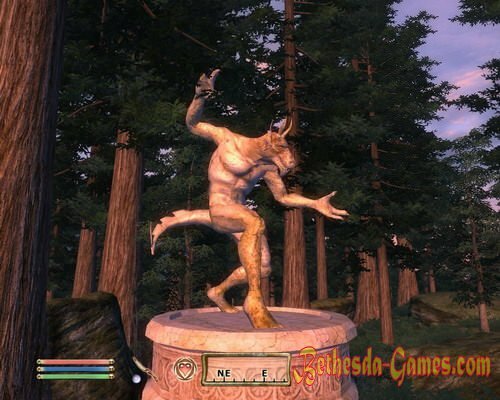 Vazhhira, a follower of the Prince of the Daedra, ascended praise his master, said that in order to talk to Hunter, should be left at the statue of the wolf pelt or skin of a bear. Girtsin wants us to hunt in his honor, but not for someone else, but a wild unicorn. 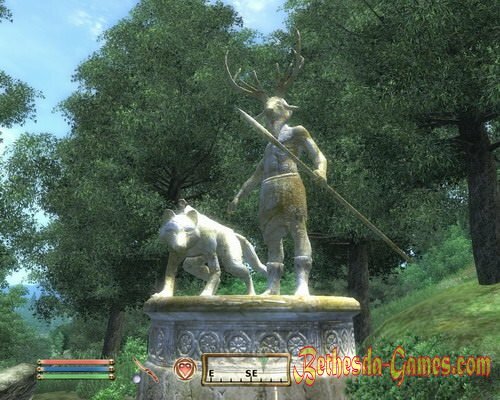 We need to get the horn of an animal and bring it Daedric Prince. Unicorn walking through the grove spit, just south of the sanctuary Hunter. Arriving at the place and casting a glance grove, notices, and security - wander a bit further three Minotaur. Straightened with aggressive-minded creatures bykopodobnymi and head to the unicorn. Being a unique of its kind, so before you deprive this lovely creation of life, can be enough to admire them and even ride. If you still dare to kill, let a tear and end with a unicorn, and then extract the horn and go to the Father zverolyudey. Pleased with quality work, Girtsin gives us Hides Savior (light armor, protection from magic 25% over, permanent effect). 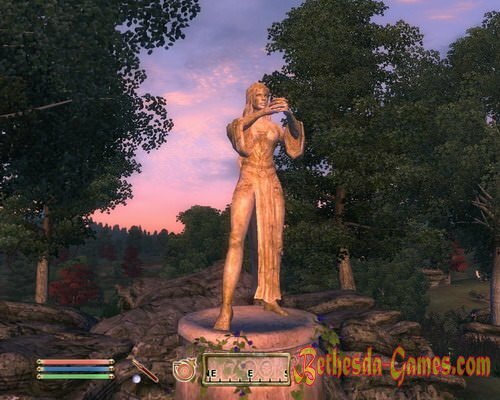 If you draw an invisible line and connect Corolla, Skingrad and the Imperial City, the Statue of Molag Bal will be located approximately in the center of this triangle. Torturer People talk to us only If we make an offering to him in the form of a cougar skins. Daedric Prince only interested in the suffering and death - Molag Bal wants noble and honest man was brought up to the edge and stepped over the edge, into the abyss. This person called Metilus Petilius, and lives in the village of Brindley House that to the south-west of the sanctuary. We need to come to this sanctimonious and force him to commit murder cursed mace, handed us a Daedra Prince. Kill it, the plan Molag Bal, will it us! But do not worry - Daedra promises to keep us alive. Trusting Daedric Prince, go towards the settlement. Search a young man in his own house does not bring any fruit, because talking with the locals. People are very good opinion of Metiluse, and they are happy to talk about his exploits. However, his achievements in the past ... During one of the battles Petiliusa his wife suddenly fell ill and died. Soldier has not forgiven himself that he was not with her ​​heavy per minute, and vowed never to take up arms. Metilus now lives alone, he left the village and moved to a hut nearby. Back and then we come back. The former soldier regularly visits his wife's grave next to his shack, so you can find it there. Nothing too important, he does not tell us, because once we pass to the case. Pre-throwing cursed mace to the feet Petiliusa (shift + LMB on the icon weapons in your inventory) to put the widower kick. Metilus seize weapons and begin to attack only if you are provoked a fight at the grave of his wife - a widower annoy your behavior in this sacred for his place. If you attack Petiliusa in his shack, he is mindful of the oath, and the finger will not touch you. As soon as the opponent will kill us, our body (fortunately, with the soul in it - Molag Bal keeps his word) will transfer directly to the sanctuary Torturer People. Satisfied that another man is ruined, Daedra reward us Mace of Molag Bal (absorption strength of 5 units. Impact; absorption of magic 5 units. Impact). Your character must be at least level 20 to begin this quest. Find sanctuary Daedra can be found to the south-east of Cheydinhal, at the foot of the mountains Walus. To invoke Boethiah we need to make an offering in the form of heart Daedra. Earn the award will have to win the tournament Ten blood. As the name implies, that in the battle will be attended by representatives of each race - you have to fight with nine soldiers, one representative from each nationality different from yours. Feel free to go past the followers Boethiah devouring us envious glances (they only dream about to die for the glory of his mistress), a portal that leads to one of the planes of Oblivion. Once in place, out of the cell and head to the great gate to the right. A massive door we expect the first candidate for the award. However, he will receive something other than expected - straightened in the battle with the unfortunate and head to the next gate. Finished off the last competitor, leave behind nine lifeless bodies whose souls Boethiah accepts without a drop of regret, go through the next gate and step into the portal opened. Finally, after leaving the field, come to the Daedra for your reward. 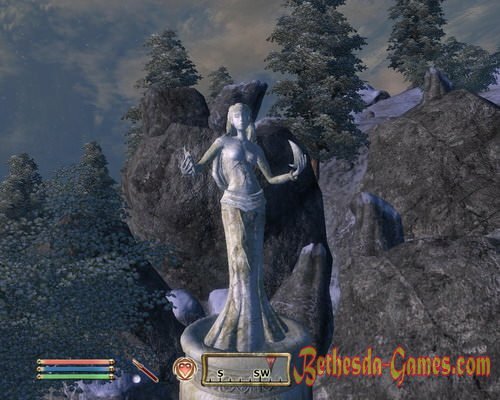 After welcoming us, Boethiah hands favorites Golden Sword (fire damage 22ed. Impact) and admonishes for new victories. 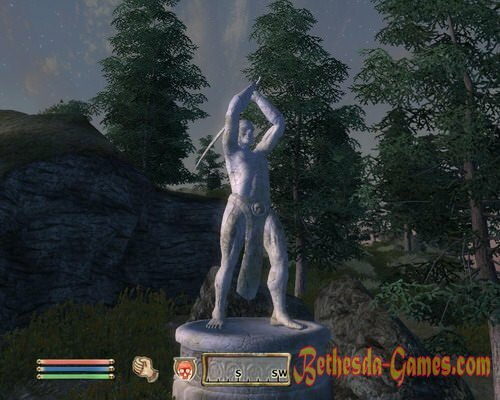 Statue Clavicus Vejle in the south-west of the Imperial City, just south of the junction of green, red and gold ring roads. One of the admirers of Clavicus Weil Hadji Ma'Raska says that if we want to talk with Daedra, you need to make an offering in the form of five hundred gold coins. Reckon the desired amount and come to the statue. Clavicus seem happy to see one of the mortals. 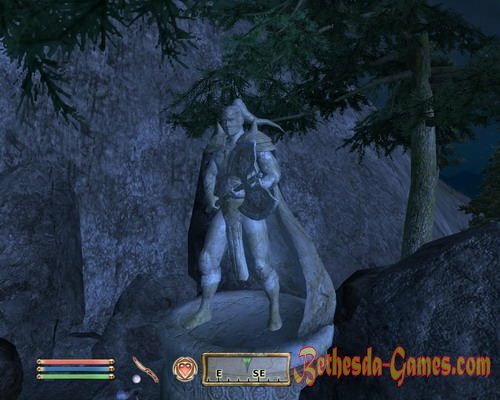 After welcoming us, the Daedric Prince immediately goes to the point - we need to find him a sword. But not simple, but with the soul of Umbria, the hero, which Weil had an affair many years ago. If we run errands, and shall bring a sword, Clavicus Vile promises to reward us with a mask. Umbra should start searching the gates of Pella - the small village to the east of the statue. However, it should hit the road as apply to us unknown. Close to anyone, but the voice is loud and clear. It turns out that this hound Weil, Barbas, whose statue mysteriously appeared among others in our inventory traveling bags. Barbas little talking about himself and gives advice concerning our job. Beagle advised to leave everything as it is, and go away, because wherever there was Umbra, all ended very badly. Barbas sure that this time will not be an exception, but Clavicus blithely turn a blind eye. Having noted the Council doggie, continue the path. Gate reaching Pella, looking Irroka Broad, who has some information about us right sword and his host. It turns out that the current owner of the sword before Lenvin name, and she was a disciple extensively. One day she brought with her black as coal blade with a serrated blade, which was said to be able to absorb the souls of men. Lenvin announced that his name - Umbra. Once she found the sword, she became bloodthirsty and changed its name - now she called herself Umbria, in honor of his arms. Irrok and the rest of the villagers have not seen her for many years, but there are rumors that the warrior seen near the ruins Vindasel located between Gates and Pella sanctuary Clavicus Vail. Go there. The rumors were true - located deep in the ruins of a girl dressed in a full set of ebony armor. It seems Umbra believes that her sword and she is a single whole, and at the mention of the Gate Pella declares that this place was in another life. The girl invites us to fight and die, or to withdraw from the world. Options that we can fight and stay alive, sociable person, of course, is not permitted. Here again taken Barbas whining and advised to return to his master and to terminate the deal. In deciding to again talk with Umbria. You can not leave empty-handed and declare Clavicus Vail to terminate the contract, but you can go to the end and take the fight. I think our choice is clear, it's not just the same as we do take this job? However, Umbra - a fairly strong opponent, and it is possible that you will still leave. If you still have the strength and patience, and you have overcome Umbria, take your sword (shower trap for 120 sec. At impact) and other trophies again Hear the annoying dog and go to their employer. Until we get to the sanctuary, think about your next step. It is possible, as agreed, to give the Daedra Prince sword and get the mask Clavicus Weil related to heavy armor (increase charm 20. Itself, a permanent effect) and can, heeding the advice of a hound, leave the weapon itself. 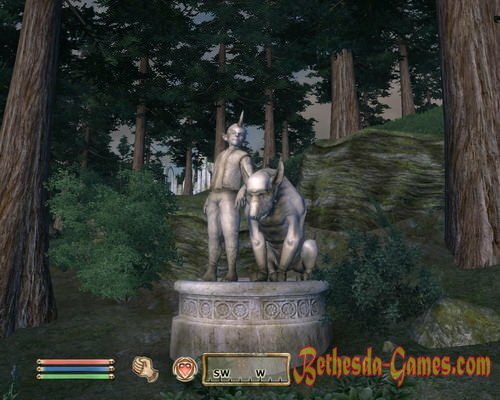 Once the statue, talk to the Daedric Prince and say goodbye to Barbas, whose statue disappeared from our inventory and again took his seat next to the host. Note: The job, regardless of whether you left the sword itself, or given away, will be fulfilled. Statue of Hermousa Mora is located far to the West from the Lord of Clouds, which rises in the hills above Brumoj. To the Lord of Knowledge brought us attention, it is necessary to pass all other Daedra quest earlier. While sleeping a certain Caste Flavus will disturb our peace of mind. Do not hurry to reach over the blade (or in a pocket for methyl valerate, nerves at all different) is not representative of the Dark Brotherhood came to your soul. The man is the Lord of knowledge and Memory, Hermousa Mora. The wanted person details see our learn on the spot. After talking with Flavusom sanctuary will be indicated on our map. As soon as the desire to snarâžaemsâ and go to the path. Mora's followers are trying to make a prediction, but for this they need the soul-one from each sound of race. Hermous spell, which teaches us to catch these souls and gives the stone Soul Hermousa Mora. It would be prudent to soul searching, where their owners deprived of protection custody order, and the most convenient for this site-visited us earlier sanctuary of Daedra. 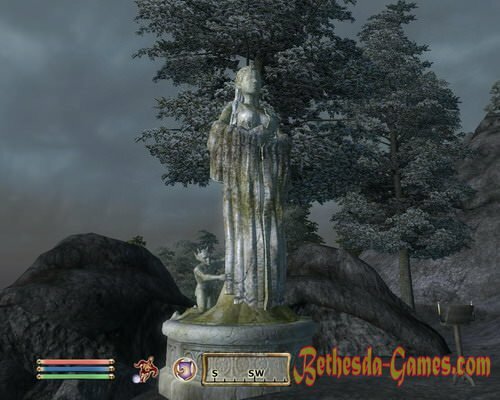 Soul hagit, Imperial and danmera you can get here, the statues of Mora. The sanctuary of Namiry, see bosmera, nordlinga and Breton. 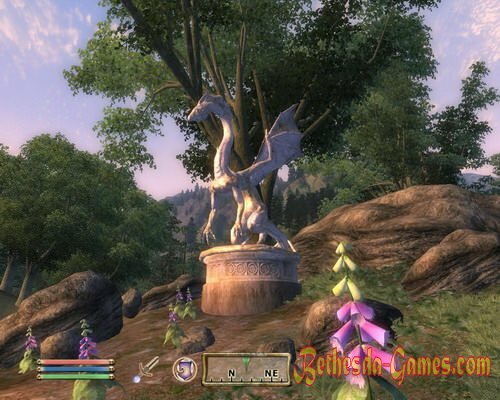 Near the statue of Mefaly oshivaetsya, redgard and next to the statue are argonianin and al′tmer Perita. Orcs in the number three pieces roam near the statue of Malakata. However, these sanctuaries is only an example, the soul can be extracted in any other place. Once all ten will be captured, we return to the Hermousu. Lord of the Memory pleased that the souls are collected, and changes the stone book of Osma Infinium. From the book can be found in the areas of knowledge that interests you most is reading one of the three ways to raise three skill and two features (read the way of the spirit is the only one) to 10 points. If you have not yet decided exactly which skills will be useful to you in the future, you can read the time delay. After you read one way, the book will disappear from your inventory. 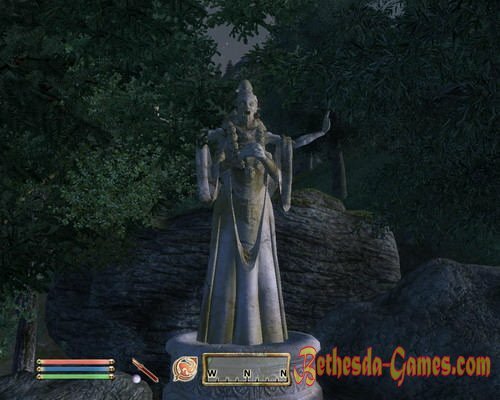 Note: get the job Hermousa Mora only after you reach the quest blood of the Daedra from the main storyline of the game.